Professor Cheryl Hendricks joined the Department of Politics and International Studies at the University of Johannesburg (UJ) in April 2013. She was appointed as Head of Department in January 2014. Her substantive knowledge areas include African Politics, Conflict Management and Peacebuilding; Gender, Peace and Security; Security Sector Reform/Security Sector Governance;Human Security; Regional Security Architectures and South African Foreign Policy. She currently teaches courses on International Conflict and Co-operation and Peace and Security in Africa. From July 2005 to March 2013 she worked at the Institute for Security Studies first as Programme Head for the Southern Africa Human Security Programme and then as the Senior Research Fellow in the Conflict Management and Peacebuilding Division. In 2004 she was the Academic Manager at the Centre for Conflict Resolution and prior to this, lectured in Politics at the University of the Western Cape. She holds a Doctorate in Government and International Relations from the University of South Carolina and a Masters in Southern African studies from the University of York, England. 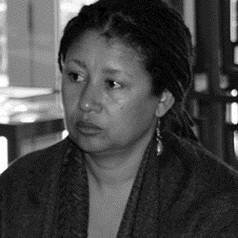 She has worked extensively with civil society organisations on gender and security, most notably with the Women’s Leadership for Peace and Security in the Greater Horn of Africa project, co-ordinated by the Club of Madrid (former heads of state) and with the SADC Gender Protocol Alliance.